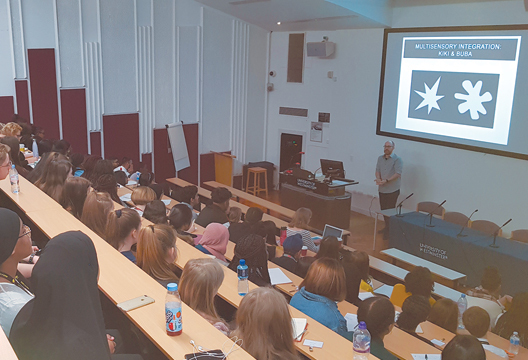 The Psyc4Schools event brought together 150 keen year 10 and 12 students from schools in London and Buckinghamshire, for inspiring talks and workshops from the University of Westminster’s academics. Dr Haiko Ballieux introduced the students to the marvellous world of illusions, multisensory integration and neuroplasticity. Can you trick your brain or does your brain trick you? Conflict between senses can lead to some interesting results: Ballieux showed a video of the McGurk effect in which mouth movements confuse the brain into thinking it heard one word, but when hearing the word without visual input it sounds completely different. Ballieux also showed the famous ‘kiki’ and ‘buba’ shapes, one spiked the other rounded, explaining that throughout cultures the former is usually called kiki and the latter buba – but why? He also outlined the rubber hand illusion, through which visual and sensory conflicts can cause us to feel bodily ownership of an inanimate hand. Dr Samuel Evans gave a fascinating insight into the workings of the inner ear – including a strange and hilarious video of a cochlear hair cell moving in time to Rock Around the Clock. He explained that hearing involves both sound itself but also our expectation of what we are about to hear. Just as people who have cochlear implants hear distorted speech, there are many people who hear voices in their heads but have no other clinical symptoms. In a study Evans put non-clinical voice-hearers in an fMRI scanner and played them either distorted speech, or sounds which sounded like distorted speech but which were unintelligible. Non-clinical voice-hearers were much quicker to notice the hidden speech than control participants. Evans said this suggests that this group of people have a primed response to hear meaningful sounds in their environment and use brain areas involved with attentional control when listening to intelligible speech (which controls didn’t). In a series of workshops the students were given demonstrations: of musical memory, the Tower of Hanoi puzzle which is used by neuropsychologists, the rubber hand illusion, yoga, and experienced a ‘human library’ in which human ‘books’ and ‘borrowers’ share experiences. In a computer lab they were introduced to the CANTAB cognitive test battery and Powerlab used to collect physiological data. Professor Catherine Loveday gave a whistle-stop tour of the fascinating, ever-changing teenage brain, including the role of a developing pre-frontal cortex (which can explain some of the risky behaviour seen in teenagers and changes in mood and behaviour). She also pointed to research which have shown the benefit of later school-start times for teenagers, with their shifting sleep patterns. The audience seemed to deeply approve.